BPU’s water program receives national award for outstanding performance – Welcome to Wyandotte Daily! The Kansas City, Kan., Board of Public Utilities has received the “Five Year Directors Award of Recognition” from the Partnership for Safe Water for maintaining and exceeding required federal drinking water standards, and for consistently having one of the top water systems in the nation. The BPU was presented the five-year award after successfully completing a comprehensive evaluation of its treatment plant operations and performance, identifying performance limiting factors, and the development of action plans to achieve optimization. 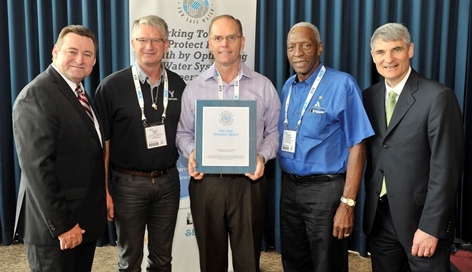 It was one of the first utilities in the metropolitan area and state of Kansas to be recognized with a Partnership for Safe Water Award, receiving its first award from this group in 2009. It is the only utility in the area to receive the “Five Year Directors Award of Recognition” milestone for five consecutive years of performance. The Partnership for Safe Water is a national initiative developed by the EPA and other water organizations to guide water suppliers toward improving water quality by optimizing system operations. It has more than 250 members that collectively serve more than 100 million people.